Albeit the goal was later put down as a Kalidou Koulibaly own goal, Arsenal midfielder Lucas Torreira celebrated with a classy dedication after his side’s second goal against Napoli. The 23-year-old did well to create space for himself on the edge of the Napoli box, but saw his effort take a big deflection off Koulibaly to send Alex Meret the wrong way as the ball nestled into the back of the net. 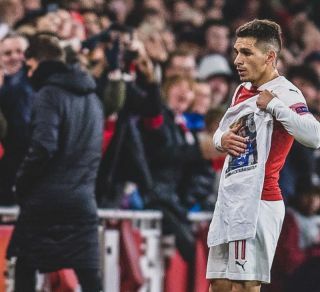 Initially, the goal was awarded to Torreira, and as seen in the image below, the Uruguayan star grabbed a t-shirt from the sidelines and dedicated his goal to a friend who died in a car accident earlier this week. “We love and miss you, Rafita,” it read. It’s a wonderful moment for the Arsenal midfield ace to have a chance to dedicate his goal to his friend, and he surely won’t care too much that it was later taken from him. His deflected effort certainly put Arsenal in a strong position in the tie though, as they’ll hope to travel to Naples next week with a comfortable advantage to defend as they look to secure their place in the last four of the Europa League. Torreira was eventually replaced in the closing stages of the encounter and received a standing ovation from the Arsenal fans after playing a crucial role in the midfield battle, pressing and keeping possession ticking to set the tone for the Gunners.